EAST MIDLANDS Archives - Aspire & Co Ltd.
KR Aesthetics is run by Kate, a fully qualified and insured dentist. Kate is passionate about skin and has developed her skills in facial aesthetics and skincare over the last four years. Kate uses pH Formula alongside other treatments, to give her clients the look they want from her discreet, privately owned space in Derbyshire. 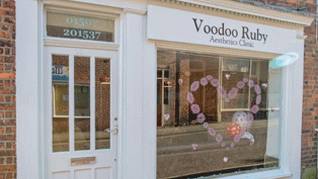 Voodoo Ruby opened the doors 4 years ago to help people with issues that shattered people’s confidence. Treatments range from Cosmetic/ Medical tattooing through to Specialist Skincare.